BUTLINCAT's BLOG: ANDY [ARNOLD] LOWE MCCARDLE R.I.P. - LEST WE FORGET - QUESTIONS ARE STILL UNANSWERED...+ NEEDED!!! ANDY [ARNOLD] LOWE MCCARDLE R.I.P. - LEST WE FORGET - QUESTIONS ARE STILL UNANSWERED...+ NEEDED!!! Originally published here 16/10/2013 @ 05:03 - thanks to B. Richards, et al.]. Andy McCardle State Murder etc. terminated our telephone conversation by putting the phone down on me. anti-psychotic drugs on Mr McCardle's long-held 'delusional belief'." 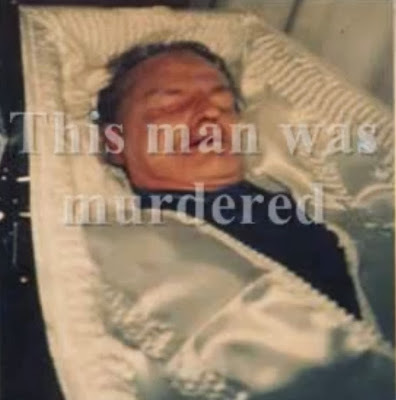 about the death of Arnold McCardle? (against his will) at the State Hospital, Carstairs? and DRUGGED Mr. McCardle against his will? had a long-held "delusional belief". 6.. Please supply the relevant law that 'allowed' you to deprive Mr.
McCardel of his liberty, and beliefs. gained your primary medical qualification. 8.. Please supply your date of birth? oral or in writing, etc. 10.. The name(s) of the persons who contacted The Sun Newspaper about M.
your 'care' - And their ages please? drugs to Mr. McCardle, and the TIME. VOMIT: 020 7727 5300 on 26 Dec 04 at apprx 5.00pm. the mattress on the floor? 17.. Were there Police Officers on the ward when Arnold McCardle died? Their names and numbers please. present when Mr. McCardle died. brother Arnold McCardle was released from Carstairs State Hospital - alive. Day evening, 26 December 2004. 23.. Why did Carstairs State Hospital want to CREMATE Mr. McCardle's body? The names of the persons who wanted this please. you not have a vested interest in his demise? and forcibly injected anti-psychotic drugs into him? McCardle's "delusional beliefs" forever? Just as you promised? 27.. When was the last psychiatric assessment done on you Dr. Thomson? You are a serious danger to the public, are you not? had died suddenly yesterday evening in Carstairs 'hospital'. to light, for all our sakes. Ann"
quote from last week's VOMIT 52. McCardle's promised computer has not arrived. have taken up his case but have backed off without giving a reason. that we meant and AK 47 and (laughingly) said that he could use one. information on Cullen, Dunblane and Crichton. Centre, Sighthill, Edinburgh EH11 4AN. Tel. No. 0131-442-2244." person who the British State have targeted to destroy, example: 1) Mr.
with death myself on 19 December 2000, in exactly the same way that Mr. The Times of 20 December 2003 for the evidence of this Irish oppression. are involve in the genocide of an ethnic community? Streets of England a free man, due to a mammoth Police and MEDIA cover-up? on my case against the Inland Revenue, and the endemic corruption in the UK. Was the regime in Iraq under Saddam Hussein as bad as this? End. with your delusional beliefs, Dr Thomson? End. the Nazi mentality being broke in the UK: "I was only carrying out orders". the madness of the British 'Justice' System. to die before they start spewing crap about him? THOSE WHO COMPLY AGAINST THEIR WILL ARE OF THEIR OWN OPINION STILL! assess the effect of forcibly injected anti-psychotic drugs on Mr.
that these are pertinent questions now under the circumstances of Mr.
today if he could talk? End. this week to secure his release. and taken back to Carstairs - despite the lack of production of any warrant. agreed, that Mr Bell had properly exercised his discretion (not to do so). demise, and who felt protected from exposure. McCardle as long as he held such belief. the medical profession and the judiciary? Was he, in fact, murdered? Many questions need to be answered. whistleblowing on Police involvement in drug trafficking . SYSTEM WHICH IS HOLDING SCOTLAND TO RANSOM. They have gone ahead with the treatment order. forcibly inject him with anti psychotic drugs. The UK is turning into a cesspit of EVIL. Submissions were made by Carstairs State Hospital and Andy McCardle. his abduction, unlawful detention and forced treatment. the sudden urgency by the psychiatrist to "treat" him? No plausible answer. when Sheriff Stewart announced her verdict. their deeds: a man's life is at stake. that their actions will be legalised by hand-picked judges in higher courts. is allowed to commit suicide). He acted in the Public Interest. with known criminals, his life is at risk whilst he is a potential witness. detained under an unlawfully-imposed section order by Dr Gray. that drug treatment "may help Andy to conduct his criminal case". QC, have been upheld but no action taken. law, and the wishes of senior judges. blocked Petition to the Nobile Officium (see below). Bench comprised the Rt Hon Justices Clark, Osborne and Johnston. Carstairs on 11th February 2002.
the State Hospital at Carstairs. 1) Make an immediate order to remove the Petitioner to a "place of safety"
proofs of all allegations herein. property unlawfully seized by State Hospital employees. Mental Health (Scotland) Act 1984.
would wish me harm to prevent any exposure of their own criminal acts. ask to be removed from The State Hospital at Carstairs to a place of safety. for in the interests of Justice. the law and the European Convention on Human Rights. Is this the savage lawless country that we call 'Great Britain'? by an out of area Police Force. evidence now and must be protected. post-mortem on Mr. Arnold McCardle. UK Member State, under this evil regime. expect you to give it your FULL attention forthwith. PPS. Is this the service you expect for your TAXES in the UK? PPPS. May you rest in peace NOW - Arnold Lowe McCardle.